The Summer has arrived and the big music festivals are about to start. Join Redkings in the only festival which YOU must not miss, the "Festival of Speed"
3 promotions combined to make a thrill-fueled speed fest of poker action and amazing prizes. With Super Turbo MTT Series, Blazing Cannon and Turbo SNGs with added cash, you'll certainly find something to satisfy your need for speed. Blazing Cannon will be running from the 8th – 25th of June. When the game is launched you are automatically sat out of the Blaze pool whilst you take aim at a house of cards and fire a blazing chip from the cannon to knock over the gold suit symbols and win an instant cash prize of €1, €10 or €100. However, a win is not guaranteed as elements such as a misfire are out to make you miss your target and miss out on a cash prize. Basically the outcome is random in every sense. Special Turbo and Super Turbo SNGs with buy-in between €1 and €20 will have money added to the prize pool. The eligible tournaments will be displayed in the Sit & Go lobby with the amount of money added. The promotion runs from June 8th until June 25th 2017. The Blazing Cannon mini-game is activated automatically when you have won twenty Blaze Poker raked hands. The game offers you a chance to win a cash prize. Play on Free Play and Heads up tables is excluded. 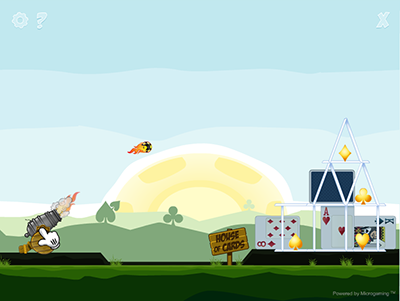 To play Blazing Cannon, click the cannon to fire a blazing chip at the house of cards. The aim is to knock down as many cards and gold suits as possible. Depending on how many gold suits you knock down, you could win a cash prize of €1, €10 or €100. Winnings are paid directly into your chip stack at the next Blaze Poker table you are moved to. The Blazing Cannon cannot be triggered from a mobile device. If you close the Blazing Cannon window, you forfeit your chance to win and are directed back to a Blaze Poker table. The promotion administrators reserve the right to modify these terms and conditions, and can withdraw Blazing Cannon at any time. Any decisions taken in this regard are final. Cash will be added to the prize pool of specific Sit & Go tournaments, which will be designated in the lobby. Only the designated tournaments are part of this promotion. For the avoidance of doubt, Double Up, Flip, Satellite, private, operator-specific, or non-Euro currency Sit & Gos are not included in the promotion. Added money is cash with no restrictions, and is added to the regular prize pool of the Festival of Speed SNG tournament. If a Sit & Go is cancelled for any reason, then the added prize will not be refunded or issued in compensation.